Sealy Unveils New Sealy® Hybrid Line with Cooling Technology | Tempur Sealy International, Inc.
LAS VEGAS, Jan. 26, 2018 /PRNewswire/ -- Tempur Sealy International, Inc. (NYSE: TPX) introduces the new Sealy® Hybrid line leveraging the best technologies from its Response and Conform lines by featuring the responsive support of an innerspring with the conforming comfort of memory foam. Delivering 40 percent more cooling comfort* than before, the Sealy Hybrid line's DuoChill™ Cooling Sleep System also features twice the cool-to-the-touch technology. "The new Sealy Hybrid line is the capstone of the unprecedented brand relaunch that rolled out in 2017, and it offers the complete package," said Rick Anderson, Tempur Sealy EVP and President, North America. "According to our research, hybrid mattress consumers are seeking sturdy support and contouring comfort with real cooling technology. 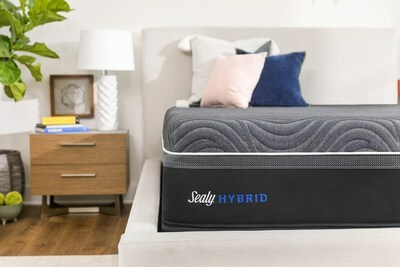 Sealy Hybrid was precisely engineered to meet those needs and deliver the best of both worlds – the perfect balance of soft on top and firm underneath – while offering more cooling benefits than ever." As Sealy's coolest hybrid mattress ever, the new Sealy Hybrid line offers cool-to-the-touch Sealy Chill™ Technology in both the top cover panel and on the sleep surface of the memory foam layer to deliver the ultimate climate control experience. Rooted in Sealy's exclusive Posturepedic Technology™, the new Sealy Hybrid line is Sealy's most supportive hybrid mattress to date, featuring nested coil technology with 20% more coils in the center to deliver reinforced support where it is needed most, while also including lightly conforming memory foam on the surface to cradle and relieve pressure points. Duraflex™ Coil Edge technology offers better edge support uniquely designed to provide more usable sleeping surface and improved durability. According to a leading consumer publication's 2016 and 2017 rankings, Sealy Hybrid was the highest rated hybrid mattress. As a trusted leader in the industry, the brand remains grounded in innovation and expertly achieves the perfect combination of delivering a soft yet firm bed that consumers are seeking by combining the exceptional support benefits from the Response line with the enveloping comfort of the Conform line. The new Sealy Hybrid rounds out Sealy's reinvigorated product line featuring its three distinct mattresses – Response™, Conform™ and Hybrid™. Each line features a collection with various features to offer a range of price points so consumers can choose the mattress that fits their needs.